7th-ranked Italy rallied all the way back for a 3-1 upset victory after dropping the opening set to top-ranked China. The Italians complete pool play with a perfect 5-0 mark, while the Chinese drop to 4-1 heading to the second round of FIVB World Championship action. After dropping the opening set, 7th-ranked Italy rattled off 3-straight wins to claim the 3-1 team result and topple top-ranked China Thursday night. With the win, the Italians head into the second round with a perfect 5-0 mark, while the Chinese sit at 4-1 following pool play. Italy was dominant on the block, outdoing China 19 to 9, and at the service line, notching 8 aces to China’s 4. The Chinese committed 22 errors, while the Italians limited their total to 10. Paola Ogechi Egonu was unstoppable in the match, compiling 29 points which included 3 service aces and 3 blocks. 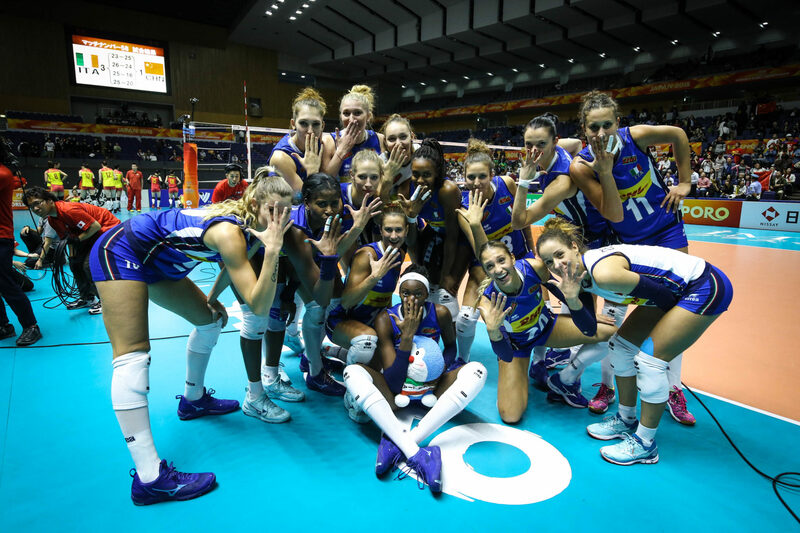 Miryam Sylla and Lucia Bosetti added 15 and 14 points, respectively for Italy. Zhu Ting led China with a 20-point effort. 17th-ranked Bulgaria sent 19th-ranked Canada packing and shored up a second round appearance with a 3-1 victory Thursday night inside Hokkaido Prefectural Sports Center. It was a pretty even performance, as each team registered 7 blocks and 8 service aces. Gergana Dimitrova and Nasya Dimitrova both notched 17 points to lead Bulgaria deeper into FIVB World Championship play. For Canada, Autumn Bailey and Kiera Van Ryk both contributed 18 points. 12th-ranked Turkey handed 25th-ranked Cuba its 12th consecutive World Championship loss in 4 sets Thursday night to close out pool play. After going up 2 games to none, the Cubans rallied to take the 3rd set before Turkey could close it out with a win in the 4th. Turkey’s 12 to 5 blocking edge and 8 to 4 service advantage keyed the victory. Cuba committed 22 errors in the loss trailed the Turks in spikes (56 to 33) and digs (30 to 14). A trio netted double figure point totals for Turkey, including Meryem Boz (17), Hande Baladin (16) and Zehra Gunes (15). Gunes led the way with 5 blocks, while Meliha Ismailoglu served up 4 aces. Ailama Cese Montalvo led Cuba with 11 points, followed by Jessica Aguilera Carbajal, who posted 8 in the match.